I took a ride up north a bit on the first chilly weekend of the new season. In my eagerness to take a ride, I really didn’t consider many seasonal preparations. I mean, I put on an extra layer under my jacket. But, I left the ventilation zippers open. I didn’t even consider long johns, and by the time I got to the Palisades Parkway, my hands were getting cold. I knew there was a button somewhere on my bars that would activate a gadget that I had never experienced before. The new T120 has more buttons, gadgets, and electronics than I am used to and I haven’t completely oriented myself yet. Then I found it. 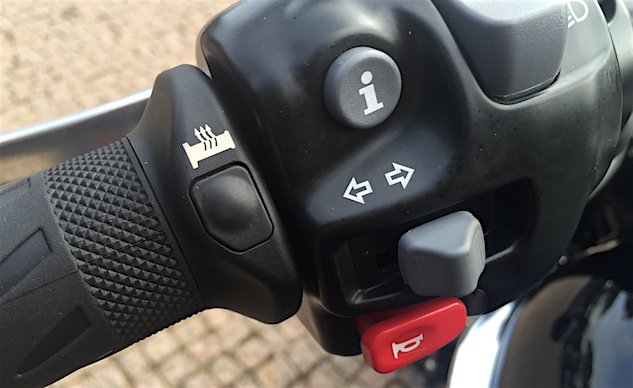 It’s a discreet little button just to the right of the hand grip on the left handlebar. Heated grips! This was my first time riding with heated grips! It’s amazing! No more stopping and hugging the engine to stay warm. My hands were toasty! Where have you been all my life? When I first took a road trip with my brother back in 2009, he had heated grips. I didn’t think too much about it then, and I never really have since. I’ve just dealt with what I had and roughed it. But DAMN! These things are great! One of these days I may even charge my phone on the USB thing under the seat! More electronic adjustments. This time good ones. 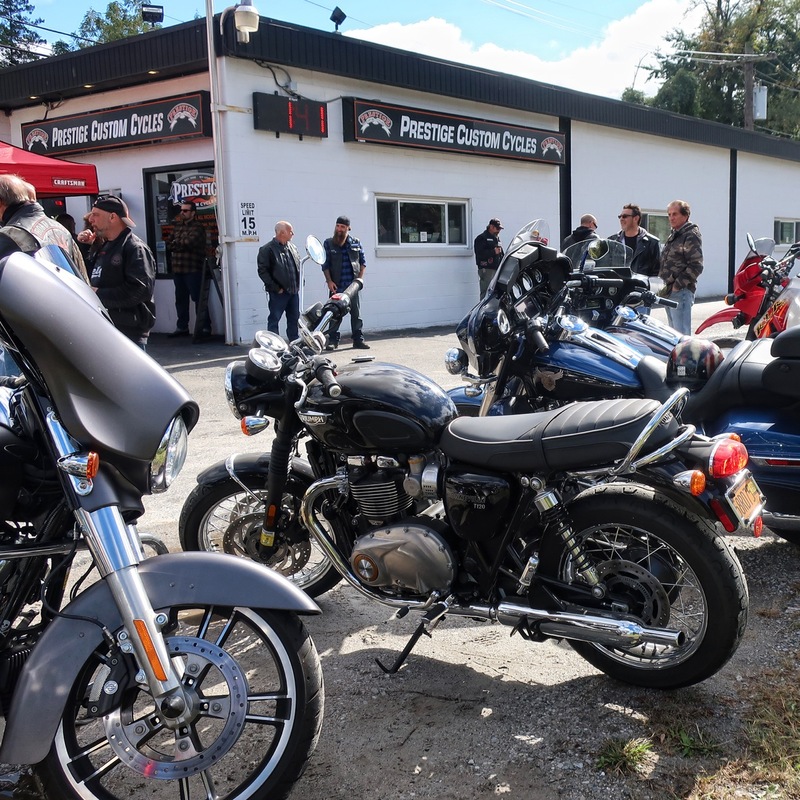 I was riding north to Elmsford, NY to check out a bike show. 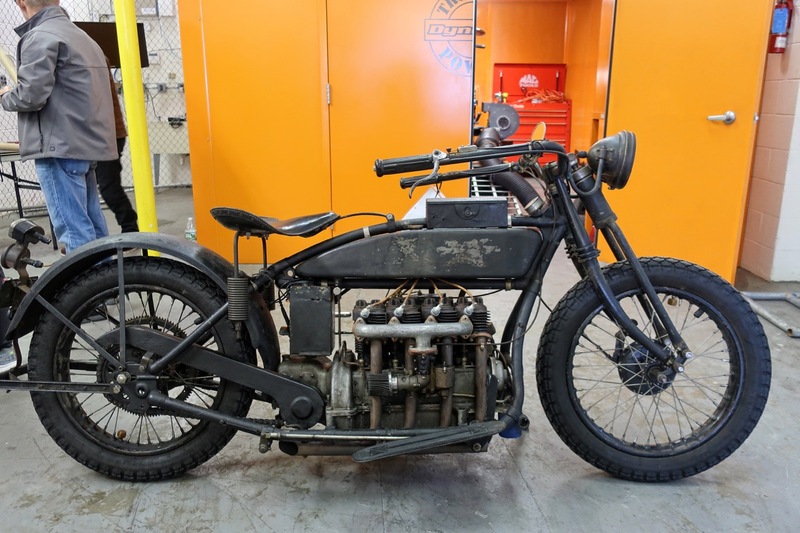 Prestige Custom Cycles is a bike shop in Elmsford. 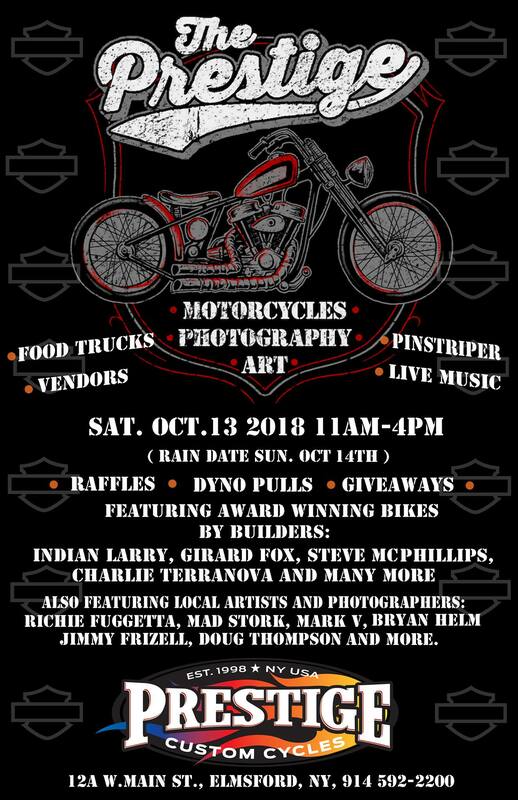 They were having an event today featuring some local motorcycle artists. I wanted to see what they had to offer. The artist’s work was located in a building beyond the one you see in the photo above. The paintings, drawings, and photos hung on a fence that surrounded the perimeter walls. 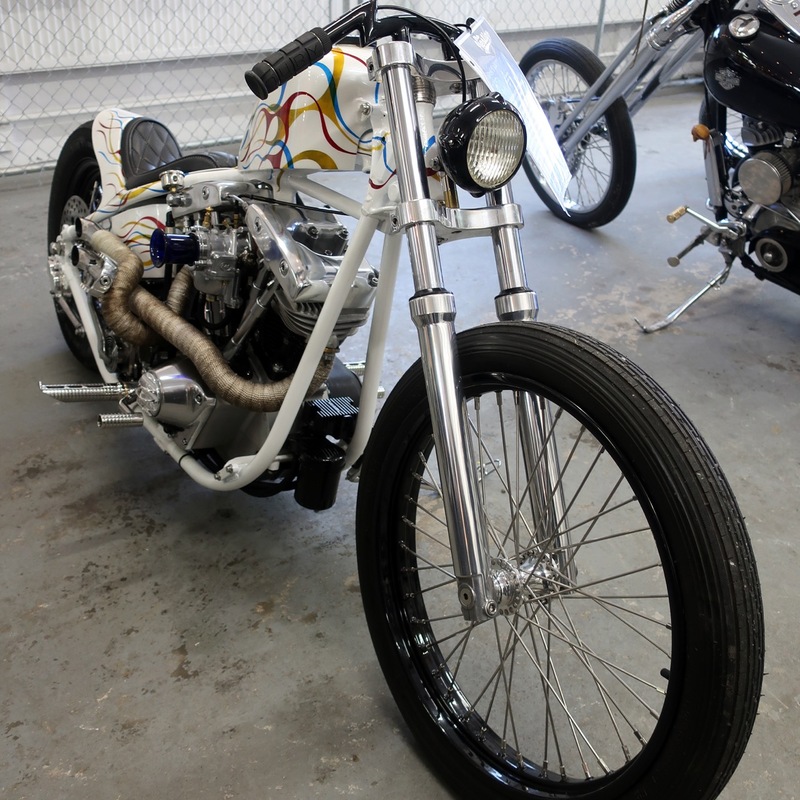 In the center of the space were some customized bikes. I recognized one name, Jimmy Frizzell. That’s his work on the left and on the table. 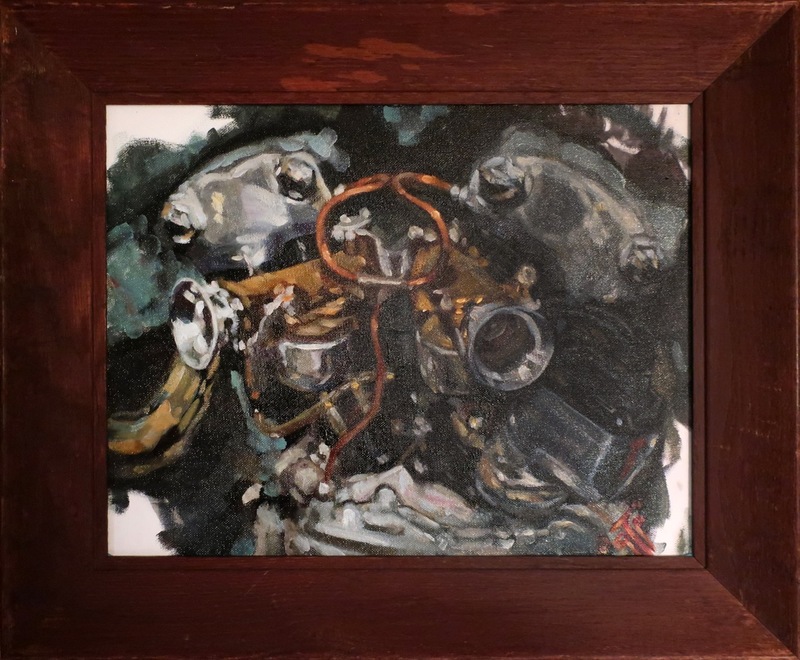 He and his brother are both artists of the motorcycle genre. George his brother, works in oil paint. Jimmy works more with line. I have one of George’s paintings (below). Another artist at this event was Richard Fuggetta AKA Rockabilly Richie. He paints in a realistic pin-up style a la Mel Ramos. 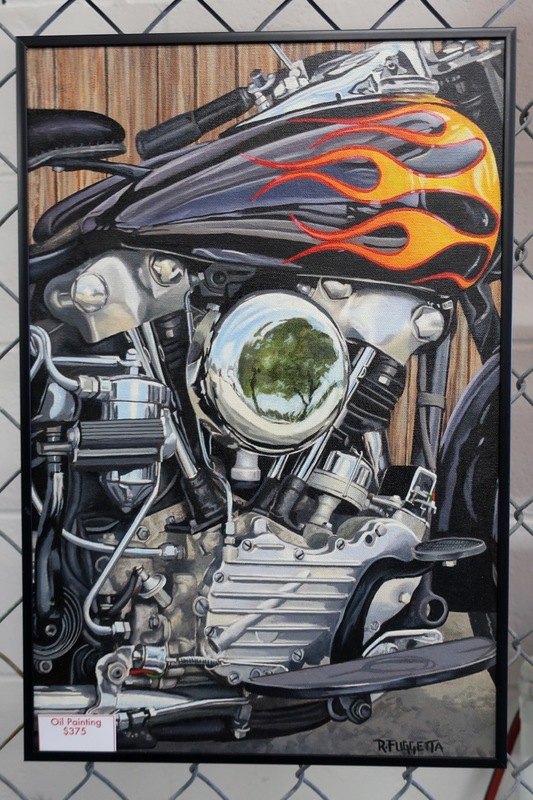 I was considering purchasing this knucklehead painting. I didn’t buy it. But I liked his work. It was more inspiring than anything else and made me want to go home and paint. Ken Geiger AKA Mad Stork was displaying some of his photos and there were a few other artists. One artist that wasn’t mentioned ahead of the event was Richie Pan. 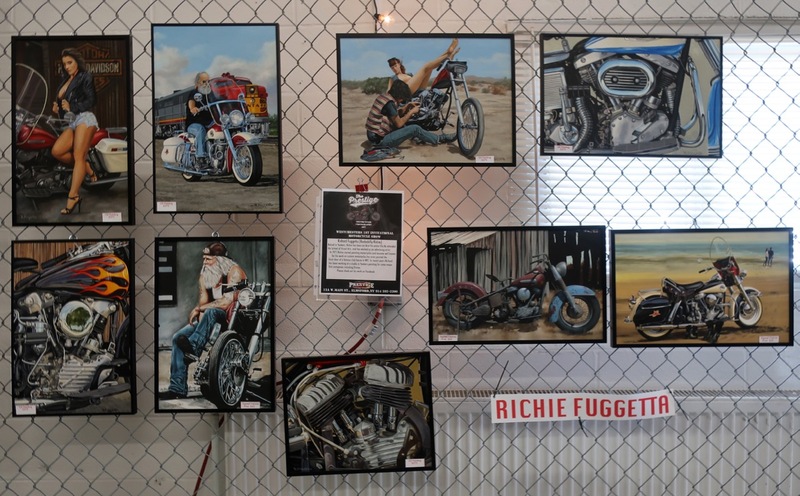 His wife Cindy was there displaying some of Ritchie’s artwork as well. 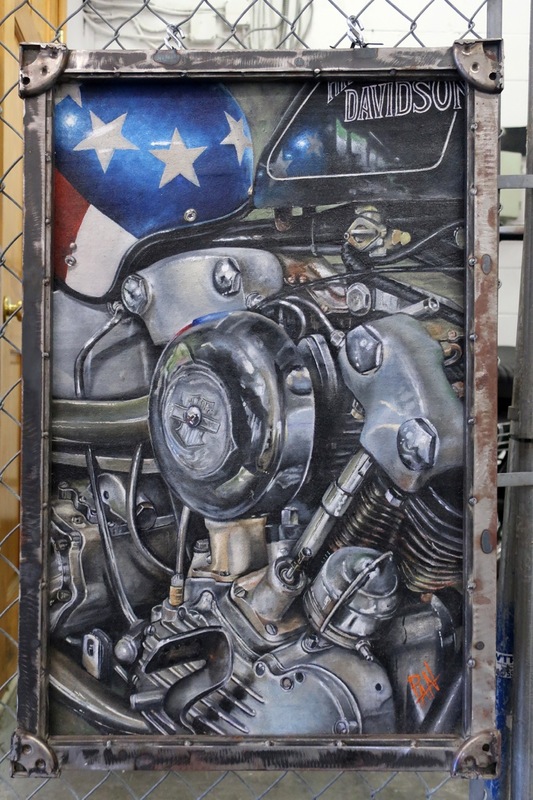 I saw a lot of Richie ‘PAN’ Panera’s work at the Buffalo Chip in Sturgis a few years ago, like this Knucklehead above. The steel frame is excellent! Richie was a tattoo artist by trade, but he also worked with a brush. 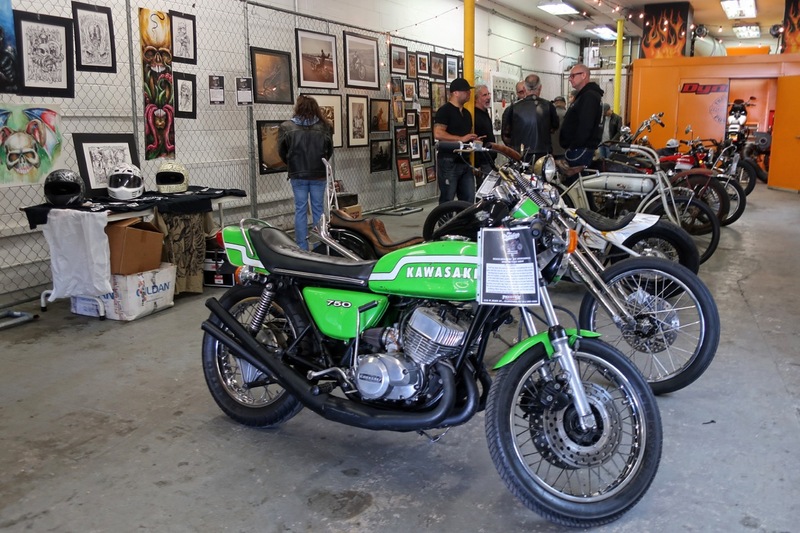 As I said before, the artwork surrounded some customized bikes lined up in the center of the room. 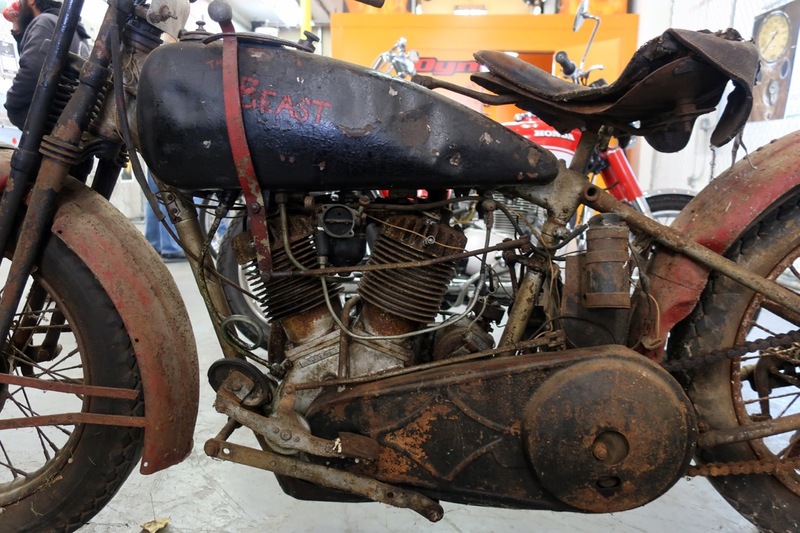 The Beast looked to be an old Harley from the late 20’s. 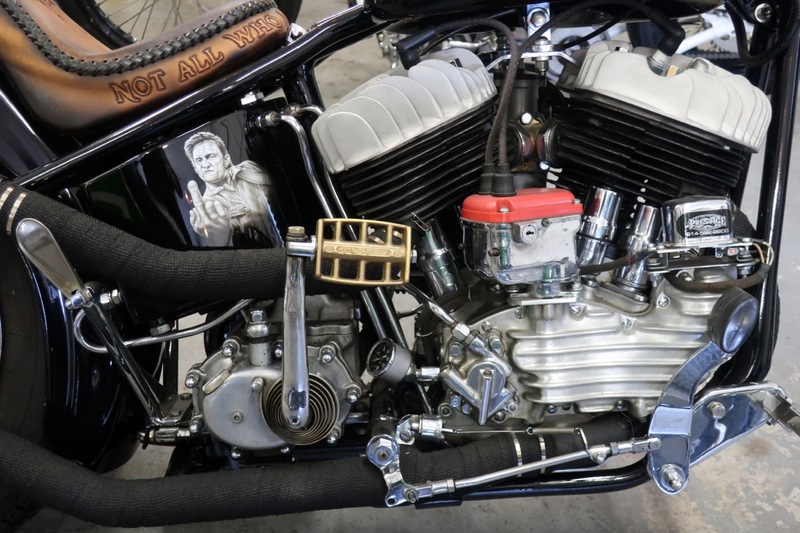 This Flathead with the Johnny Cash salute was a Prestige build. This early 20’s Henderson closed it out. It was a nice small event and a great reason to get out of the hectic city. Hopefully, the fall will bring some mild weekends for some adventures before it gets too cold. I took Route 9A all the way back to the city. I zipped up those ventilation flaps and was loving those heated grips! When I got home a package had arrived. 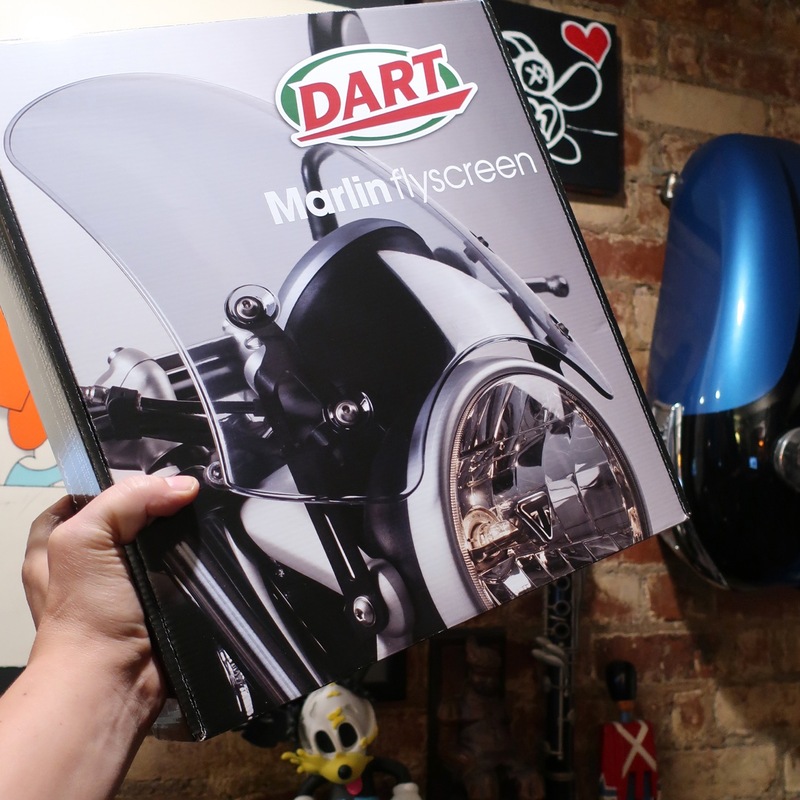 I got a fly screen for the bike. The selection for flyscreens is more limited for the T120 than the T100. I really liked the T100 screen that wrapped around the headlight. We’ll see how this looks on the new bike soon. The screen is much darker than the one you see on the box. 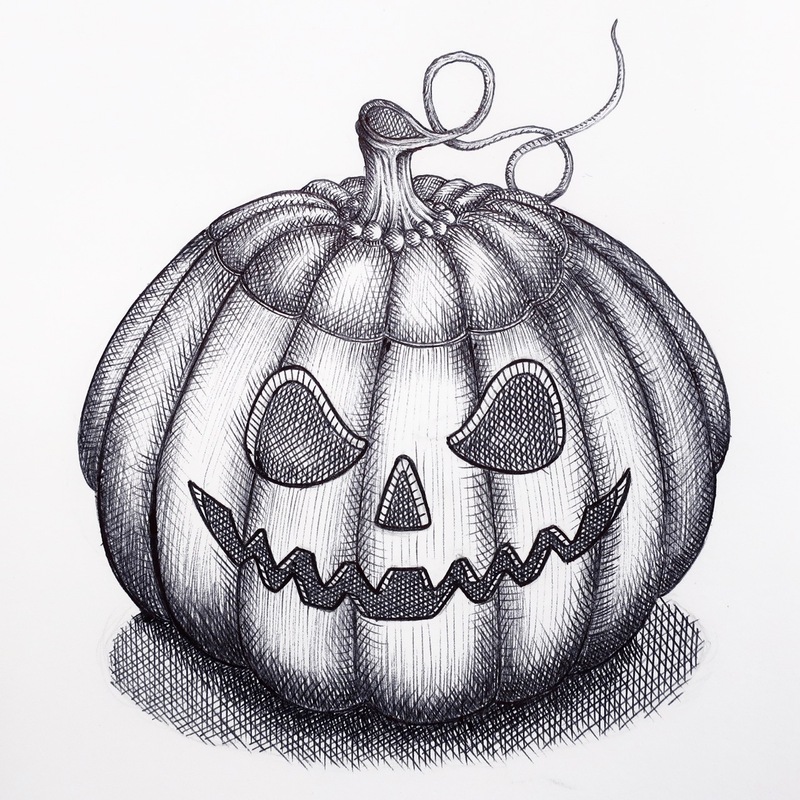 Given the artwork theme of this post, I will display a drawing I did and wish everyone a very Happy Halloween! This entry was posted on October 14, 2018 at 1:30 pm and is filed under Uncategorized. You can follow any responses to this entry through the RSS 2.0 feed. You can leave a response, or trackback from your own site. Hey Nancy! If I pass by the shop again, I’ll say hello! Good to hear from you. Hope you are enjoying life in Thailand. Funny the way the world is so small, I’m reading your latest post sitting here in Thailand. You and I worked together in NYC many years ago and I’m reading your story about a bike shop that my cousin works in. He’s not one of the artist, he’s a mechanic there. Dido is what I call him but his name is John, if every you pass that way again say hi, with your new wheels, I don’t think you will need his help but always good to know. 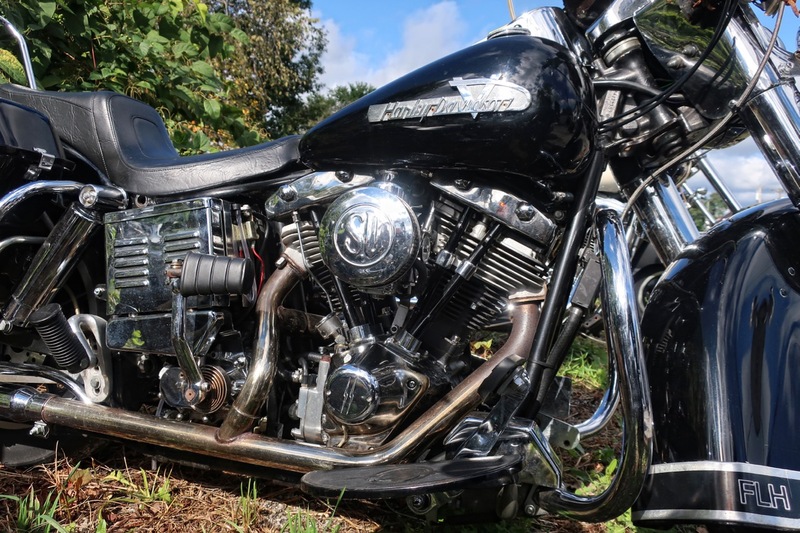 Happy riding….